EDITOR'S NOTE: This is the first installment of a new monthly photography column by Texas Parks & Wildlife magazine chief photographer Earl Nottingham. Please send questions and comments to Earl at earl.nottingham@tpwd.state.tx.us. ﻿﻿The problem with your photos may not be your camera. It may be your computer monitor. ﻿﻿I’m often called upon to explain why someone’s new high-dollar, multi-megapixel digital camera takes such lousy photos. Usually, after several e-mails and phone conversations discussing camera settings and shooting conditions, I’ll ask to see examples of the problematic images, only to find that when I view them on my computer they look just fine. It turns out many times images that look terrible on our monitors are not the problem of the camera or the photographer but of the monitor itself. Just as a television can be adjusted for optimal color, so can a monitor. Most computer users unpack a new LCD or CRT monitor out of the box, plug it in and never think twice about the tools available to calibrate the monitor to a viewing standard that will ensure that the beautiful image they saw when they first shot it looks the same (or very close) on their monitor — and on any other calibrated monitor or printer. You will be amazed by the before-and-after versions of the same image without and with calibration.The results can be dramatic. There are several ways to calibrate a monitor, and chances are that you already have some of those tools available in your existing monitor and computer’s display settings. Optionally, there are peripheral plug-in devices for critical color and exposure rendering. The first step to calibration is to look into the menu settings on the monitor itself. Some will have a set-up screen that will guide you in setting the color, exposure and contrast levels. Some will have color presets for specific uses like games, graphics or, in our case, photo editing. Many times, just setting the monitor levels will display photographs at an acceptable level for the casual user. The next step is to use your computer’s own software, which works in concert with the monitor. Depending on your computer’s operating system, you should find a “Calibrate” tab in the Control Panel under “Displays” or “Color Management.” Mac users will find it in System Preferences/Displays. Once there, you will be taken through several user-friendly steps that will adjust the color, exposure and gamma (contrast). There are also several online calibration tools that can be accessed by a simple Web search for “monitor calibration.” Although they are not as full-featured as your computer’s applications, they do offer some basic levels of color and gamma correction. 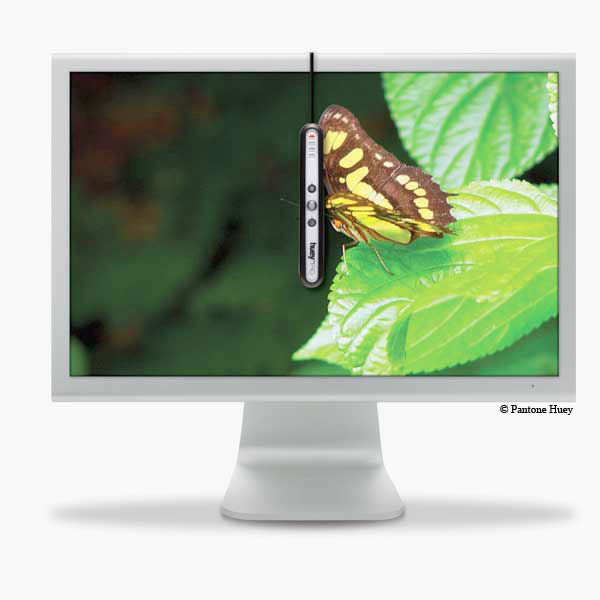 The third, and most accurate, method to ensure critical color and exposure balance is a USB device that attaches to the monitor via small suction cups and actually “reads” the color from the screen as it goes through the calibration process. Two of the most popular are the hueyPRO (www.pantone.com/pages/products/product.aspx?pid=562&ca=2) by Pantone and Datacolor’s Spyder3 Pro (http://spyder.datacolor.com/product-mc-s3pro.php). I personally prefer the Popsicle stick-shaped hueyPRO because of its small size and its sensor’s feature that continuously monitors the ambient room light and adjusts the brightness level accordingly. Considering that our computers contain the modern-day equivalents of the venerable photo album, it only makes sense that the blue skies, green grass and pink babies should remain as true to life as possible. Monitor calibration ensures that they do.